< Back to the map (alternative version) or index list. 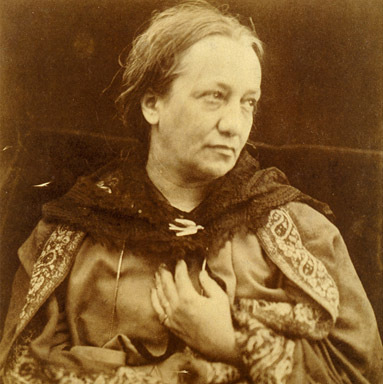 “Aunt Julia appeared as a terrifying elderly woman, short & squat – dressed in dark clothes, stained with chemicals from her photography (& smelling of them, too) with a plump eager face & piercing eyes, & a voice husky & a little harsh, yet in some way compelling & even charming.” Laura Gurney, Julia Margaret Cameron’s great-niece. Julia Margaret Cameron aged around 65. Tennyson may have been the leading luminary of the Freshwater circle, but photographer Julia Margaret Cameron (1815 -1879) was its driving social force. Her arrival in 1860 had a considerable impact on life in the Tennyson household. Julia would often turn up, unannounced, arms laden with gifts. Shortly after moving in to Dimbola, she presented a somewhat bemused Emily with two legs of Welsh mutton & several rolls of vivid blue wallpaper. 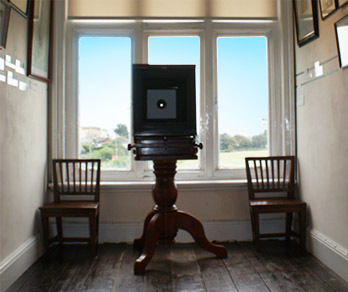 Camera similar to the one Julia Margaret Cameron used. Iago – One of Julia Margaret Cameron’s photographs. It was out of this chaotic domestic environment that Julia Margaret Cameron produced some of the most striking images of the Victorian age. Left – An early photograph by Julia Margaret Cameron. Right – Tennyson & his two sons, Lionel & Hallam. Her distinctive portraits helped to cement the fame of the various literary, artistic & scientific greats who congregated around her home & studio on the Isle of Wight. 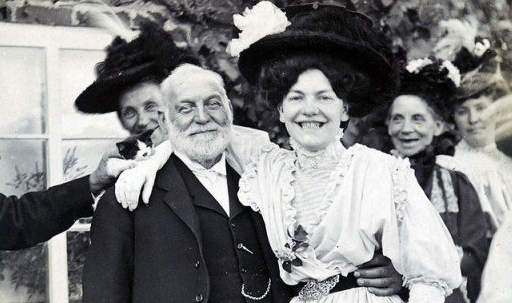 One of the reasons why people rarely smiled in Victorian photographs is because it took several minutes to take a picture & holding a smile for this long looks false. Find out more about the history of photography. 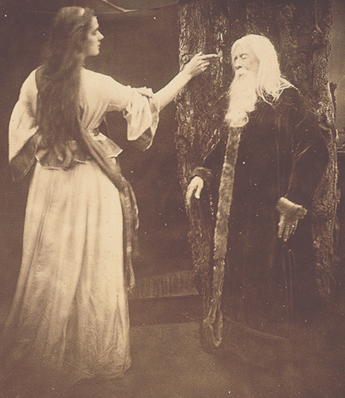 When, in 1874, Tennyson suggested she produce a series of photographic illustrations for his poem Idylls of the King, Julia Margaret Cameron responded with customary enthusiasm. Julia also collaborated with other members of the circle. She organised a joint exhibition with photographer, Lewis Carroll, & discussed ideas & techniques with painter G.F. Watts.